There is nothing quite as exciting as an amphitheater filled with avid fans, and performances filled with energy. 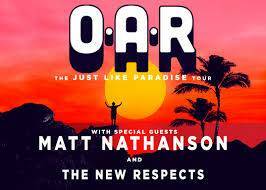 Thus was the scene at Stir Cove on Friday night, when Matt Nathanson and O.A.R. took the stage. Nathanson hails from Lexington, Massachusetts and is a prolific singer-songwriter of the indie rock genre. He shared with the audience that his heart is in heavy metal, but his paycheck comes from his ability to deliver folk, pop and alternative sounds instead. He loves to interact with the fans, and did so with nearly every song, telling tales of the origin of the lyrics, and asking the crowd to join in on choruses. Nathanson played a variety of guitars, including a 12-string, acoustic and electric version. His talents were remarkable. The set was full of fun, chatter and beautiful music. When he broke into “Shattered” the entire field sang along and it was a beautiful, nearly spiritual moment. When O.A.R. took the platform, their energy emanated the Cove from the first chord to their very last note. Quite the opposite of the loquacious Mr. Nathanson, O.A.R. played a number of tunes before lead singer Marc Roberge took a break to acknowledge the crowd. Mind you, not one person was complaining. The Rockville, MD band started their set with “Black Rock” and it was consistently uphill from there. Band members were dancing to the sounds along with nearly everyone in the bowl. It was so refreshing to see almost the entire fan-base on their feet rather than lounging in their chairs. The music was just too good and the rhythms were just too hard to resist. The night was enchanting.